If you look up wasps, you'll find a lot of information about how to get rid of them. But contrary to reputation, wasps can be of benefit to gardeners, feeding on caterpillars, aphids and other insects that can be pests on the plot, particularly in early summer when they are feeding their larvae. It's only in late summer, when their protein requirement is much less and they seek out dessert, our fruit, that we notice any anti-allotment behaviour. Sucking the juices of apples and pears (they need another beast to have broken the skin on this type of fruit for them), but particularly enjoying the soft-skinned delights of plums and grapes which they can penetrate all on their own, they could be seen as a bit of a pest, but really only if they are concentrating their number in one area. Wasps are in general social creatures. The vespula species (of which there are several V. vulgaris, V. rufa, V. germanic) lives either in dark spaces such as tucked into shed roofs, just where you don't want them, or underground. 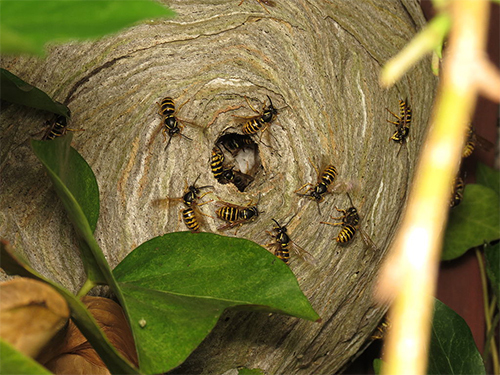 The dolichovespula species (D. media, D. saxonica, D. sylvestnis) make their nests in the open air, outside buildings or in the branches of a shrub. Finally, the hornet, the largest British wasp, is contradictorily the least aggressive and seeks out holes in trees and other dark spots to live in. Dressed in its unmistakable yellow and black stripes, wasps are sleek characters with a cinched waist and pointy end—this snazzy look prompted Enrico Piaggio to name the famous Italian scooter Vespa when he first saw the MP6 prototype in 1946. As for its stinging potential, the wasp is rightly more feared than the bee, but in reality it will usually only sting in defence of its nest if disturbed (or of course, if attacked). They might appear more aggressive in late summer because of their partiality to sweet food, thinking nothing of flying in to share a jammy piece. If left alone, they'll go about their business in harmony with gardeners. A colony begins with the end of a young queen's hibernation. On waking, she looks for suitable nesting sites and, on her own, begins to build the nest in which she lays the first eggs. 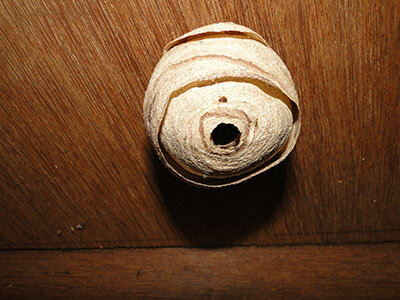 Worker wasps, infertile females, pupate in the tiny nest. The queen must feed them (again solo) so that they can take over some of the more laborious tasks in the nest (building work etc) leaving her to concentrate on laying more eggs. By July, the nest can be football-sized and contain up to 500 workers. At this stage, males appear on the scene along with the fertile females who grow on to become queens the following year. At the end of the season all but these new queens die. They find a quiet, dark spot to shelter in over winter, beginning the nesting cycle again the following spring. If at all possible, wasps nests are best left alone. They are only used once, dying out in the autumn and are never re-visited by the wasp colony.